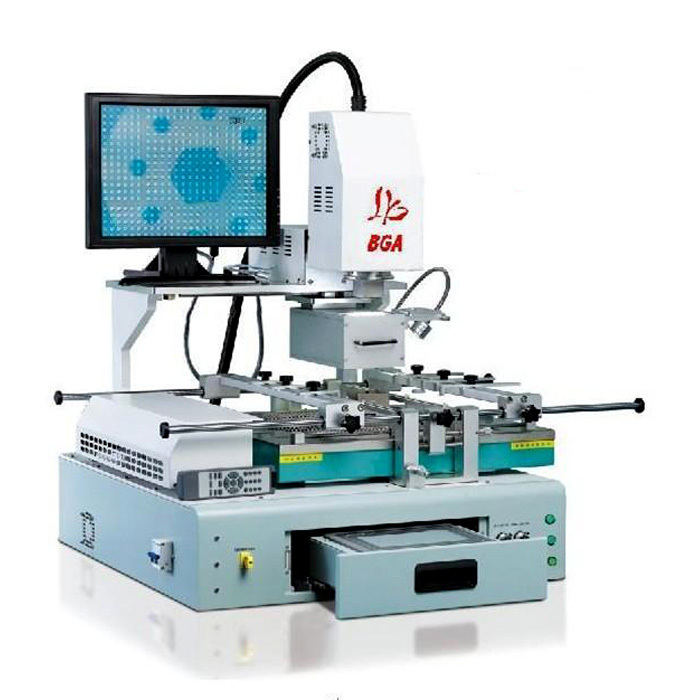 Ly-X3 is an economical rework station with optical alignment system, and manually controlled with the integration of soldering and desoldering design; applicable to BGAs of all forms of encapsulation. 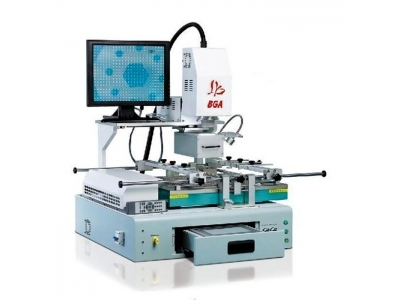 Hot air head and mounting head integration design, direct heating after mounting without moving PCB to avoid BGA misplaced, dual-speed motor drive, hot air head moves up and down by hand. New-style hot air and IR mixed 2 in 1 for upper head heating; temperature rises fast, which leads to the big temperature difference between BGA and others around with no effects on them; suitable for PCB with small pitch between components. Three separate heating areas, upper/lower hot air and bottom IR; heating time and temperature can display on the touch screen. Large movable bottom pre-heating area, PCB clamping device can be flexibly adjusted on X/Y-axis; Reworkable Max. PCB size 550*550mm. Powerful cross flow fan cools down the lower heating areas quickly. Color high-resolution optical vision system with split vision, zoom in and fine-adjusting functions, aberration distinguish device included, auto-focus, software operation, 22x optical zoom, reworkable BGA size range 1.5 * 1.5 mm ~70*70mm. Inbuilt vacuum pump, rotatable 60° in Φ angle, fine-adjusting mounting suction nozzle. Upper/lower heater with 8 segments of temperature up (down) and 8 segments of constant temperature control, industrial computer can save temperature profiles without limit; can analysis profiles on the touch screen. Suction nozzle can detect mounting height automatically with pressure controllable within 10 grams. Many sizes of alloy nozzle, easy for replacement; can locate at all angle. Color optical vision system manually operated. Equipped with thermocouple port, real-time temperature monitoring and analyzing functions.